We find two great gangs of political speculators, who alternately take possession of the state power and exploit it by the most corrupt ends — the nation is powerless against these two great cartels of politicians who are ostensibly its servants, but in reality dominate and plunder it. It was always our view that in order to attain this [proletarian revolution] and the other far more important aims of the future social revolution, the working class must first take possession of the organised political power of the state and by its aid crush the resistance of the capitalist class and organise society anew. Among all the large and small nations of Austria, only three standard-bearers of progress took an active part in history, and still retain their vitality — the Germans, the Poles and the Magyars.… All the other large and small nationalities and peoples are destined to perish before long in the revolutionary world storm (Weltsturm). The first act by virtue of which the State really constitutes itself the representative of the whole of society—the taking possession of the means of production in the name of society—this is, at the same time, its last independent act as a State. State interference in social relations becomes, in one domain after another, superfluous, and then dies out of itself; the government of persons is replaced by the administration of things, and by the conduct of processes of production. The State is not abolished. It dies out. 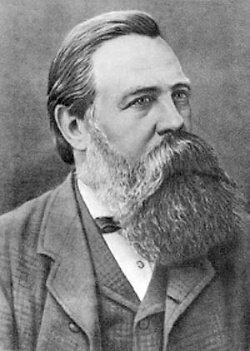 Bio: Friedrich Engels was a German philosopher, social scientist, journalist and businessman. He founded Marxist theory together with Karl Marx.